The Ford F-150 is as big pickup truck. You might think that every mount would work on a Ford F-150. Turns out not to be the case. We take a look at how to mount a cell phone, tablet or GPS in a Ford F150. 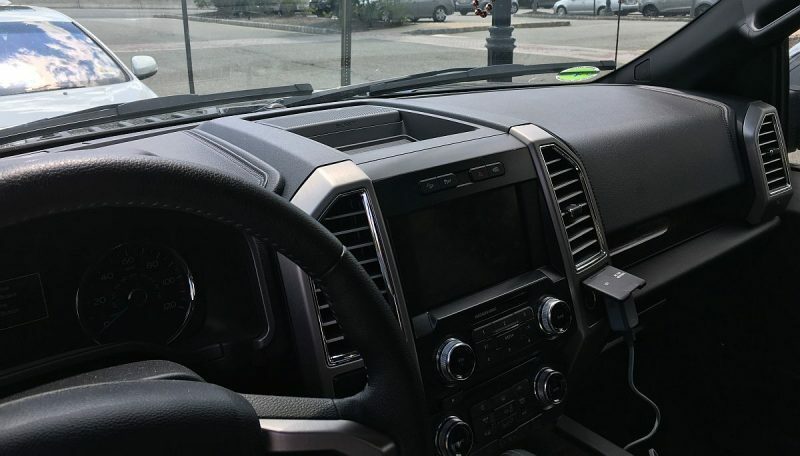 A photo of the interior of a Ford F-150 accompanies this article. It’s a large interior with a nice big dash and a long reach to the windshield. Normal horizontal vents and a long reach down to the cup holders. So let’s see what’s going to work. For a cell phone, I like the vent mount best. The vent mount to the middle left near the driver is an excellent location. Easy to see and simple to install on the Ford F-150 vents. The TechMatte MagGrip Magnetic Car Mount Holder for SmartPhones is an excellent choice. The mount has a magnetic surface a little larger than a US Quarter. The back has four prongs that are used to attach to a car vent. This design allows attachment to either a horizontal or vertical vent. The attachment to the vent slats is accomplished by aligning a vent slat between the prongs and pushing forward. There are included metal strips which attach to the back of your case or phone. That’s how it attaches to the mount. You can also use this for a GPS that has a flat back. It’s a mighty long reach to the windshield. Like I said, this is a big vehicle. Consider an extra long suction cup solution such as the Arkon Extendable Smartphone and Midsize Tablet Mount. The cradle is spring-loaded and expands to over 7 inches . It’s going to fit most smartphones and tablets up to an Apple iPad Mini. The mount itself has a metal arm that can extend from 14.5 to 18.5 inches. The cradle rotates 360 degrees so your tablet can be in portrait or landscape mode. The suction cup has a vacuum lock to maintain a secure connection. The metal arm will keep the tablet very steady in normal environments. A normal suction cup phone mount will also work but it’s a long reach to the windshield on a mount that projects a few inches off the glass. My recommendation for the short mount is the Arkon MegaGrip Suction Cup Windshield and Dash Mount. The suction mount features a vacuum locked suction assembly attached to a pivoting arm. The phone can swivel into any orientation. The mount also comes with an adhesive disk that you can stick to the dash to turn the mount into a console mount. The suction assembly can adhere to the adhesive disk just like it would on a windshield. This is a very reliable mount and I can vouch for it based upon my years of personal use. Negative on a car seat bolt mount for the Ford F-150. I could find no way to access the seat bolt. While you can certainly use the option to bolt it directly to the floor board, most are not going to want to drill holes into their Ford F-150 floor, so let’s move on. That’s a huge dash you got on that Ford F-150! You can use the two suction mounts I mentioned already as they both come with an adhesive disk so that you can use it on a flat dash surface. This option is best for states where mounting to a windshield is illegal. Since the dash is so large, and especially where that tray is in the middle, you can consider using the Arkon Friction Dash Mount for SmartPhones and Midsize Tablets. This includes a cradle that opens to over 7 inches so it’s going to fit most smartphones and tablets up to the size of an Apple iPad Mini. The included bean bag weighted dash mount weighs almost two pounds and has a safety anchor which I suggest using. The device can swivel 360 degrees and will pivot and tilt. I’m not liking the location of the CD Player on the Ford F-150 so I will recommend against a CD player mount. Using a mount in this location will block the radio and climate controls in this vehicle. A cup holder mount is the only way to place a larger tablet in a Ford F-150. The Arkon Car Cup Holder Mount for Tablets is a good choice and fits large tablets all the way up to an Apple iPad Pro. This cup holder mount features an adjustable arm to facilitate angling and it swivels into any orientation. The cup holder mount fits up to 3.5 inches diameter so it will fit the Ford F-150 just fine. So the Ford F-150 isn’t as easy as I had initially thought for mounting a cell phone, GPS or tablet. Many traditional locations such as the vent, windshield or dash will work well. However, the CD Player and seat bolt mount are out. On a positive note, the truck is large, you can mount almost all of your devices and still have room for five.